Kids always think that they are invulnerable and that can make for a pretty intimidating life for those of us who are obliged to keep them from suffering any lasting harm. Now, many of us are alright with the idea that they’ll head out and scuff a knee or even get a bit of a black lip in the midst of their play. It builds up a bit of an immune system and also helps to teach them some practical lessons about personal safety while also letting them actually live out their lives. Still, there are limits to what we’re willing to let them expose themselves towards! So, when we noticed that there was a rather boisterous knight hanging around the neighborhood, offering to duel a bunch of the residents in order to gain passage down the sidewalk, alley, or once even to get inside the bagel shoppe, we had a few concerns. Fortunately, the knight wasn’t too much of a struggle to defeat… excepting that he just kept coming back and seemed to suffer no pause from any damage that he suffered. It immediately made us all realize that this guy was going to teach our tykes that they were truly immortal… even if it meant losing a couple limbs!Flesh wound, our butts! So, we are getting ahead of this fiasco by giving you the opportunity to educate your tykes on the amazing Black Knight yourselves. 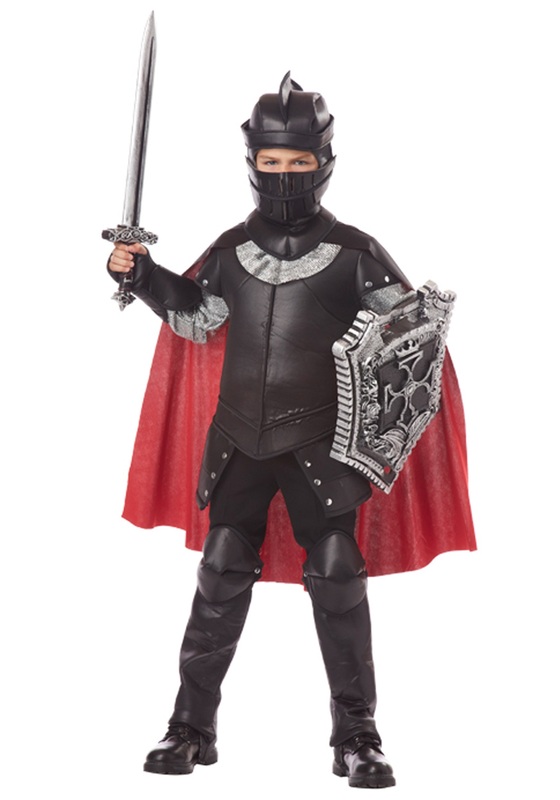 This costume is a complete and near historic armor set including a foam fronted shirt with a silver mesh collar and sleeves to imitate chain mail and a foam helmet that fastens by Velcro and covers the whole head. The foam armaments continue, including gauntlets, boot tops, knee guards, and the face grille can optionally cover the face or be left open. A bright red cape finishes off the look, though you can accessorize with a weapon and shield for the full package. 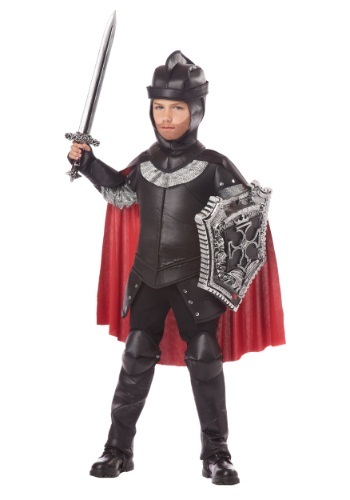 With all this armor, your tyke will be truly protected, though we still recommend avoiding blocking the paths of certain kings.